Disciplines dealing with the built environment, including urban planners, landscape architects, and urban designers, are reconsidering the role of their disciplines in urban food systems. By urban food systems we mean the soil-to-soil system that enables food to travel from source to plate in cities. 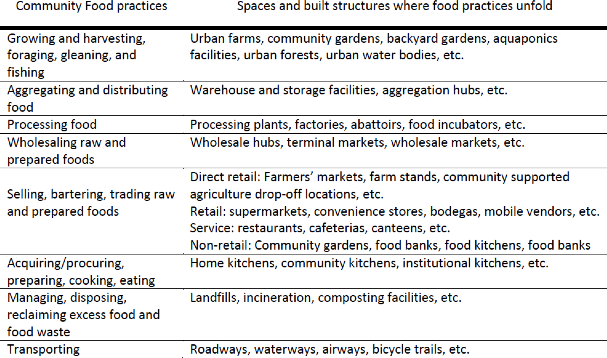 Urban food systems involve a variety of actors that engage in diverse foot-related practices including the growing, processing, distribution, and acquisition and preparation of food, and management of food-related waste. These practices unfold within the built environment of cities, and are inextricably linked to the work of planning and design professions (table 1). And, indeed, urban planning and design professionals are engaged in a variety of efforts to strengthen urban food systems. A recent survey of members of the American Planning Association, the largest professional association of planners in the Unites States, found that planning for urban agriculture was one of the top ways in which city governments are engaging in the food system. While this growing attention to food systems by planners and designers is critical, the theoretical frameworks, strategies, and tools for doing so remain unclear and contested. Scholars and practitioners are especially concerned about how the growing engagement of the planning and design disciplines reinforce, exacerbate, or subvert inequities within food systems. A Best Paper Prize will be awarded for an early career scholar who submits an accepted paper. Authors are invited to submit an abstract by November 14, 2016. For more details on the special issue, please review the full announcement. Questions about content of the special issue should be directed to Samina Raja at sraja@buffalo.edu. Questions about the submission process should be directed to Enjoli Hall at foodsystems@ap.buffalo.edu.